What if the UK takes part in the EU Parliament elections? Have the British public had enough of experts? Who does the public blame for the housing crisis? Is there a shy Tory factor in 2015? In 2005, ICM’s final call polls had the same Labour lead (in ICM’s case 6 points) before and after the reallocation. In other words, on the eve of the election, the adjustment wasn’t pointing to a shy Labour factor and the polls, as usual, were biased against the Conservatives. In 2010 the situation was very different. The adjustment, for the only time I’m aware of, was a full three points in Labour’s favour. Each of the 8 eve-of-election polls underestimated the Labour vote, with most also understating the Conservatives as usual. Since then, the adjustment has moved back into more familiar territory. 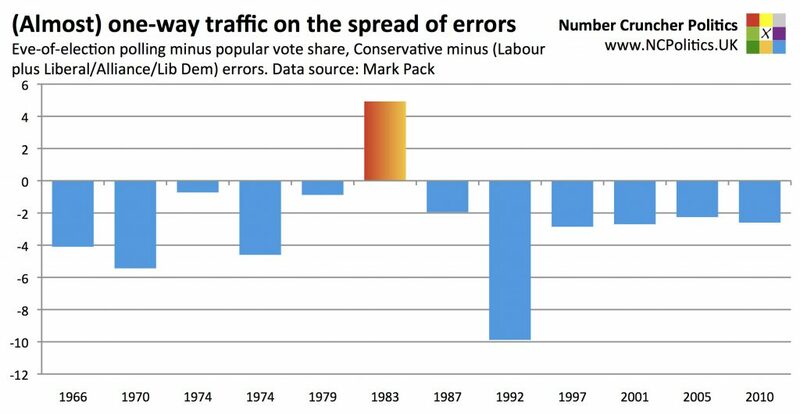 This is significant, because it supports the theory that the 2010 shy Labour effect was temporary, and that our neutral case should be a pro-Labour bias. Note that the zero line on the above chart should not be taken to imply no expected error. In 2010 an adjustment of -3 saw the polls pretty close in terms of the Labour-Tory spread, in 2005 a zero reading saw the Labour lead overestimated by a couple of points, while in 1997 a +3 saw it overestimated by four points. 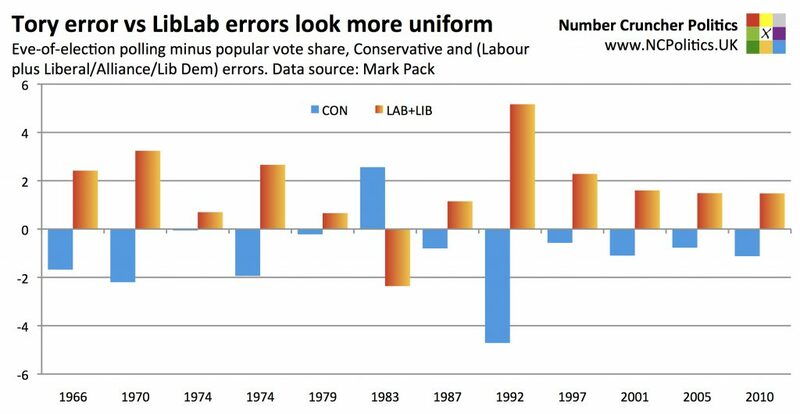 Also worthy of note is that by combining the Labour and Lib Dem votes, the errors post-1992 have been almost uniform, ranging between -2.3 and -2.9 points. It’s almost as if the changes have made the overall error more predictable (and also slightly lower). An overestimate of the Lib Dem vote seems far less likely in 2015 than 2010, because their share is likely to be so much lower. NCP founder Matt Singh is the elections and polling analyst that publicly predicted the 2015 industry-wide polling failure the day before. He is based in London and tweets at @MattSingh_. For further information and media inquiries, please see About NCP. Number Cruncher Politics is the non-partisan UK polling and psephology site that predicted the 2015 opinion polling disaster. For more information please see the 'about' page or connect via social media. Disclaimer The information on this site is believed to be correct but no representation or warranty is made as to its accuracy. NO RESPONSIBILITY WILL BE ACCEPTED FOR ANY LOSS OR DAMAGE RESULTING FROM YOUR USE OF THIS SITE.